Halloween is just a month away so here is a fun and super duper thrifty craft... Dollar Store Ghosts! Kudos to my mom who came up with this idea. -A clear slightly frosted glass candle holder thingy (I'm sure that must be the official name for it) from the dollar store for you guessed it, $1... mine is from Dollar Tree. -A fake tealight. These were 2 for $1 at Dollar Tree. So now for the incredibly long and complicated directions... haha just kidding. 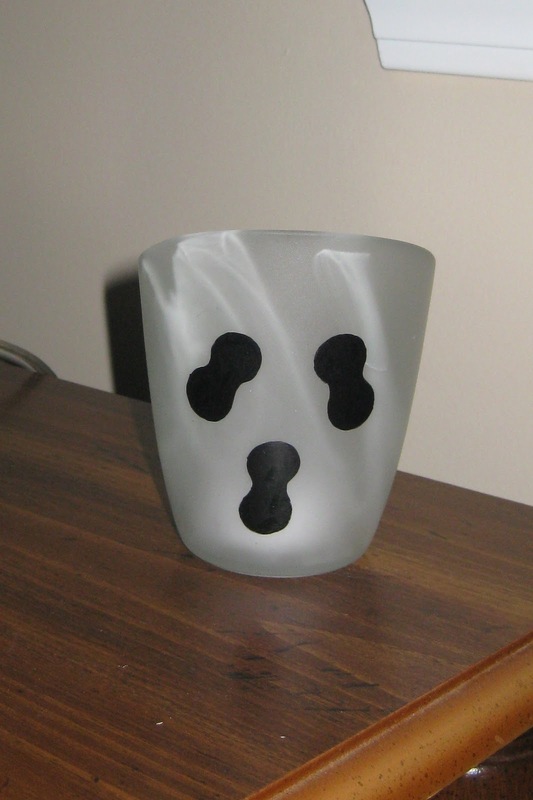 Take black pen and draw a ghost face on your candle holder thing. It slopes down on half of the holder so I made that shorter part the back. Put tealight inside. TA-DA! Was that simple or what? The weather turned out to be wonderful which is rare in SC in early Sept... usually it is extremely hot. We had a wonderful time tailgating and each brought a few things. I think the key to a good tailgate is definitely great food with some of it needing to be filling so you don't feel like all you ate was chips. Speaking of chips... one thing I made was a very simple but yummy ranch salsa dip! 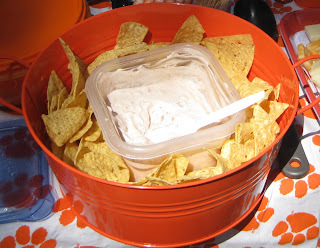 I have been making this for years and it is always a favorite at tailgates and parties. You need 1 packet of ranch dip (it's powder, usually near the dressings), 16 oz. container of sour cream (I use red. fat), and salsa. I mix the the packet with the sour cream and then add salsa until it has the desired salsainess that I want. You could use whatever kind of salsa you preferred. It goes great with any kind of chips, crackers, veggies, etc. After plenty of tailgating we were off to the stadium. I always enjoy walking through the campus, Clemson has the best college campus (in my opinion so that means it has to be correct, how can you argue with that right?) and brings back tons of memories. 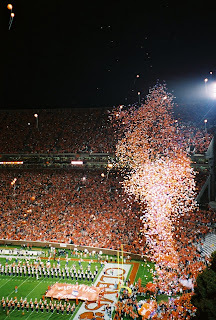 I love how it looks when everyone is wearing orange and how loud it gets in death valley! It did get a tad hot during the first half of the game but we won so that was great! I can't wait until the next time we get to go to Clemson for a game!! GO TIGERS! Sidenote: apologies for the delay in a new post. We switched my blog over to blogger from wordpress and took awhile to get everything working. There will definitely be more than 1 post this week so look forward to that! Can you believe it's more than halfway through Sept?! I have this centerpiece on our kitchen/dining table that is so very summer and thrifty too. I took some play sand from Lowes and filled the bottom and then topped it with a tall candle and shells from the dollar store and a garage sale. I wanted to show it since I will be changing it out soon for something fall-ish. FALL. And FALL = FOOTBALL (college football that is, who really cares that much about pro. college is where it's at.) And lots of other nice things like changing leaves and pumpkin bread. So fall is a close 2nd to summer. There is just something really happy about watching gameday, tailgating, and watching (or going to if you are lucky) your team play and watching all the other big match ups week after week. I have been a football fan my whole life. I was born a Gator fan and I became a Clemson fan when I went there for college so Clemson is my #1 and UF my #2. Since I have been a fan of both the 2 teams have not played each other so that is good news for me. Eric and I went to Clemson for the 1st game this year and we had a blast.. it's always great to go back. I'll do a post about that soon! Are starting to enjoy fall or what? I know I am! GO TIGERS! If I had my little way I'd eat peaches everyday. In addition to my love of summer veggies, I have a love of summer fruit... mainly peaches. I asked my friend Gen for this recipe after she brought it to our house for dessert when Eric and I made mexican food. She compiled it from a bunch of different recipes and I tweaked her recipe some too so I guess that makes it pretty original ;) I made it 2 times this summer after trips to wonderful farmers market for peaches & blackberries. Both times everyone loved it. Mix fruit and place in bottom of a deep casserole dish. Mix orange juice and white sugar and pour over fruit. Mix remaining ingredients in separate bowl until crumbly. Sprinkle crumb mixture over fruit mixture. Bake in oven at 350 for 30 minutes. So so good! Let me know if you try out the recipe. I wish peaches were in season for longer (get 'em now while you still can!) but this would be good with apples and some tweaking.